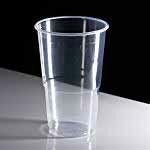 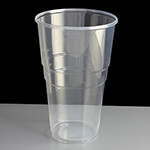 Plastic pint and half pint glasses have grown rapidly in popularity in recent years. 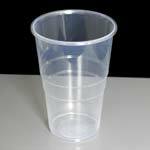 Changes in legislation. 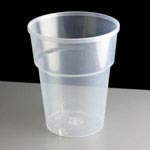 customers drinking at outside events, smoking areas outside pubs and later regular drinking hours mean that drinkers can now expect to drink from a plastic glass rather than a normal glass. 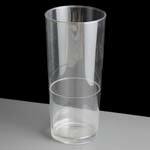 The quality of plastic pint glasses available now is far superior to examples we all remember in days gone by. 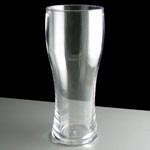 We are able to offer a range of pint glasses that should be able to meet all requirements, all of which are CE stamped, essential if you are selling pints of beer. 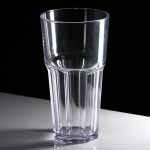 Below we have outlined the various options available to you along with their advantages and disadvantages to help you decide which plastic pint glasses are right for you. 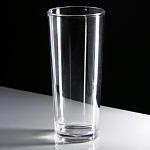 For the ultimate in quality and most glass like weight and feel, why not have a look at our polycarbonate half and pint glasses? 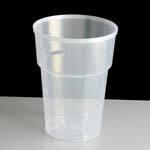 Made from the same material as riot shields, polycarbonate wont shatter if dropped and are perfect around the pool/patio and late night drinking. 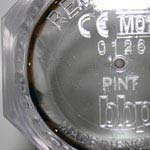 They can be dish washed up to 500 times before showing any signs of wear and tear. 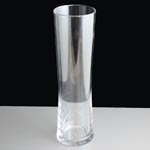 Traditional pint glass shapes and styles are available including: Tulip, straight, nonic and pilsner, all of which are CE stamped and a couple are even nucleated for extra fizz. 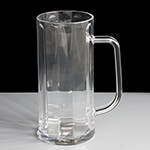 Click here to buy our Unbreakable Plastic Pint Glasses now. 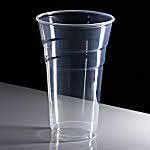 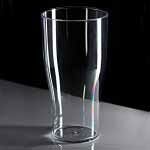 If you are a licensed establishment serving pints and half pints then you will need CE Marked plastic glasses. 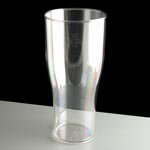 Good news, all of our pint and half pint plastic glasses are CE Stamped, even our disposable ones. 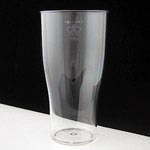 'Nucleated' pint glasses have a etching on the bottom of the glass to help increase and maintain the head of draught beers and lagers. 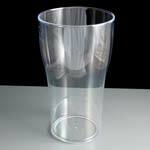 Some of our polycarbonate pint and half pint glasses come with a nucleated option. 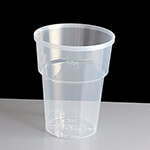 If you do not require something quite so durable and at a bit of a better price then try our re-usable polystyrene pints and half pint glasses. 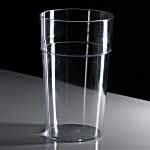 They have the same clarity as our polycarbonate glasses, but may crack or break if dropped. 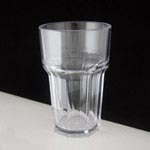 You will still be able to reuse and dish wash these glasses up to 100 times before they show any signs of wear and tear. 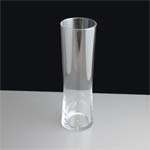 Styles available include traditional Tulip (pictured right) and a stackable tumbler, both of which are CE stamped. 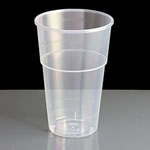 Click here to buy our Reusable Plastic Pint Glasses now. 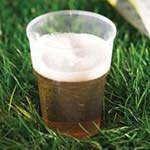 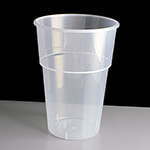 The single use disposable pint and half pint glasses are perfect for large events right down to the one off party or BBQ. 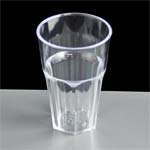 Inexpensive, these glasses represent excellent value for money; use once and throw away / recycle, without the hassle of washing them up afterwards. 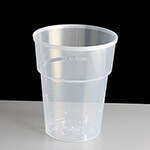 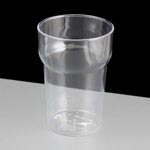 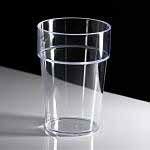 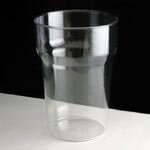 We stock 2 types of disposable pints, traditional flexi glasses which can squash a little easily and the rigid Katerglass (pictured) which are thicker and firmer to hold but a little more expensive, both types are CE stamped. 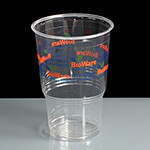 Click here to buy our Disposable Plastic Pint Glasses now. 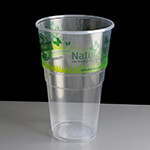 Looking for a disposable single use pint glass but want something a little more environmentally friendly? 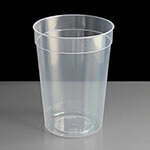 Why not have a look at our biodegradable plastic pint glasses and half pint glasses which have been made from an oxo-biodegradable plastic meaning they will degrade in landfill or sea in 1-2 years with 0% plastic residue. 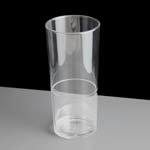 Our glasses are very cost effective and have a low carbon footprint when compared to other bio pint options made in the US and Chine. 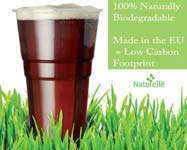 Click here to buy our Biodegradable Plastic Pint Glasses now.